The Nine Foot Stake is a well-known coral reef that is a part of the Florida Keys National Marine Sanctuary. The reef takes its name from a telephone pole that marks the area. Two mooring buoys mark two sets of coral fingers. While the reef is part of the Sanctuary, it is not protected as a Sanctuary Preservation Area (SPA) and the same rules that apply to Sanctuary Preservation Areas may not apply to the Nine Foot Stake area. You'll find Nine Foot Stake at N 24 28.294 W 081 45.855. This dive is good for divers and snorkelers of all levels since the depth is fairly shallow, ranging from 15-30 feet on average. 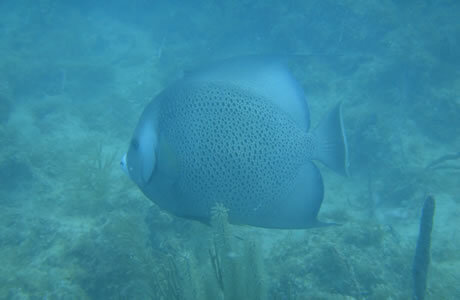 This is one of the most popular dive sits in the Florida Keys because it is so accessible and well marked, and also because it offers excellent opportunities to view and photograph marine life. It is located conveniently close to the impressive wreck of the Cayman Salvager, a large ship in deeper waters which may offer a slightly more challenging dive. As part of the Florida Keys National Marine Sanctuary, the Nine Foot Stake coral reef area is home to numerous delightful species of sea life, and is particularly famous for offering exciting night diving opportunities. Nocturnal hermit crabs, anemones, brittle stars, nudibranches, and other denizens of darkness peek out of hiding at night and go about their activities. You'll also enjoy seeing schools of fish and larger fish like barracudas. Other species in the reef include Spanish hogfish, blue tags, and yellow goatfish. While there is no shipwreck in the area, you will be able to observe the remains of a small lighthouse. Nine Foot Stake is easy to find, fun to dive or snorkel, and offers an opportunity for a marine life enthusiast at any level, so don't miss it on your trip to the Florida Keys.